Before 1722 the area of the Virginia Colony between the Tidewater and the Blue Ridge was considered a frontier area left to the hunting grounds of Native American tribes. Then, in 1722, Governor Spotswood signed the Treaty of Albany which effectively restricted the Iroquois to the lands west of the Blue Ridge Mountains. Essentially, this opened the area to settlement by European pioneers who were rapidly exhausting the Tidewater lands of the Mid-Atlantic Colonies. At the time of the Treaty of Albany, the land that comprises Loudoun County was all part of the Northern Neck Proprietor. The entire Northern Neck area of Virginia had been granted by Charles II of England to six of his followers who had remained loyal to the Crown during the rule of Oliver Cromwell. By 1700 several of the original grantees had died and Lord Culpeper had secured the interest of the others to become sole Proprietor. The Proprietorship was subsequently inherited by marriage by the family of Lord Fairfax. In order to protect his interests in the New World, Lord Fairfax appointed a resident agent to distribute "patents" to the lands. Just short of ownership of the land, a patent required an annual "quit-rent" be paid by the grantee as compensation to the Proprietor. For example, Nicholas Cresswell noted in his 1777 journal that the annual quit-rent for 100 acres was 2 schillings, 6 pence (Cresswell, p. 197). A series of resident agents made liberal use of "waste lands," making themselves large grants of the land under their control. The most notorious of these was Robert "King" Carter. Appointed resident agent in 1702, Carter held roughly 300,000 acres at his death in 1732 and had over 1,000 slaves (Harrison, p.197). The earliest patents pertaining to the land in the vicinity of Waterford were held by a small group of land speculators none of whom actually resided in western Loudoun, then part of Prince William County. Among these was Catesby Cocke, the first clerk of court for both Prince William County (est. 1731) and Fairfax County (est. 1742). Cocke resided in the town of Dumfries, and was a speculator in Western Loudoun land. 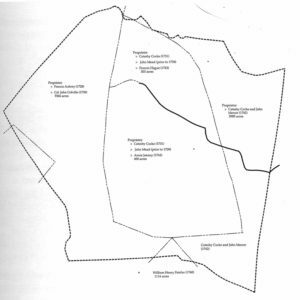 Cocke secured the patent in 1731 for the parcel of land which would become Waterford after the warrant, or request for survey of a parcel, was originally taken out by Richard Averill and John Mead (Northern Neck Land Grants, p. D-13). 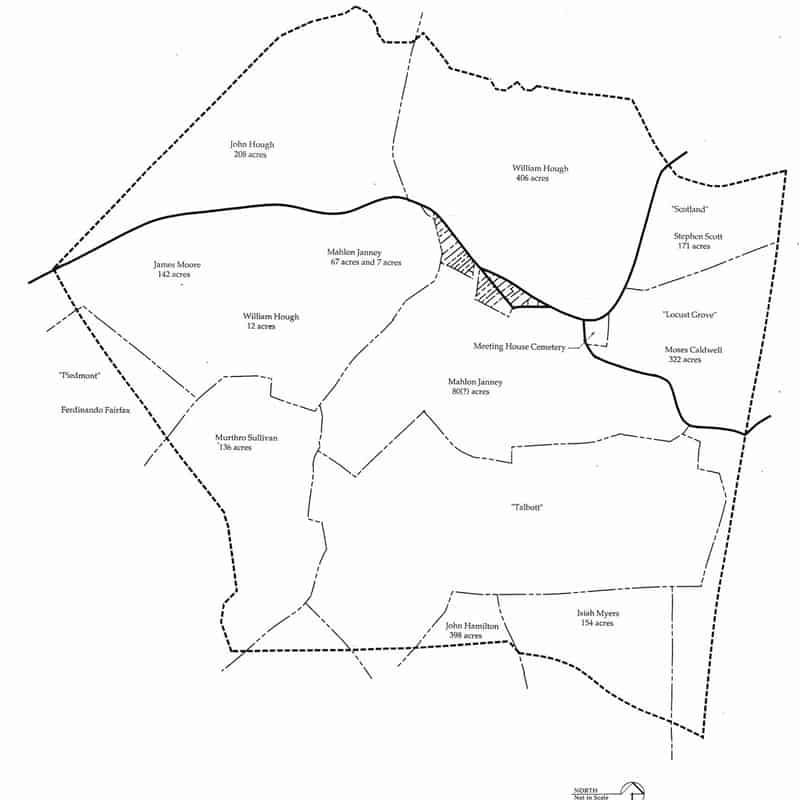 Other patents were granted for areas of land surrounding what was to become Waterford. George and John Mercer held the patent for 5985 acres extending northeast from Waterford to Taylorstown (Northern Neck Land Grants, p. E-441). John Colville, identified as a "merchant now of Prince William Co.", procured the patent on the acres "between the hills" from Catoctin Creek to the Blue Ridge (Northern Neck Land Grants, p. E-502), and William Fairfax of Belvoir took the area from what is now Harper's Ferry to Gregory's Gap in the Blue Ridge (Northern Neck Land Grants, p. E-233). Those who were originally granted the land by patent from the Proprietor were free to do with it as they wished. 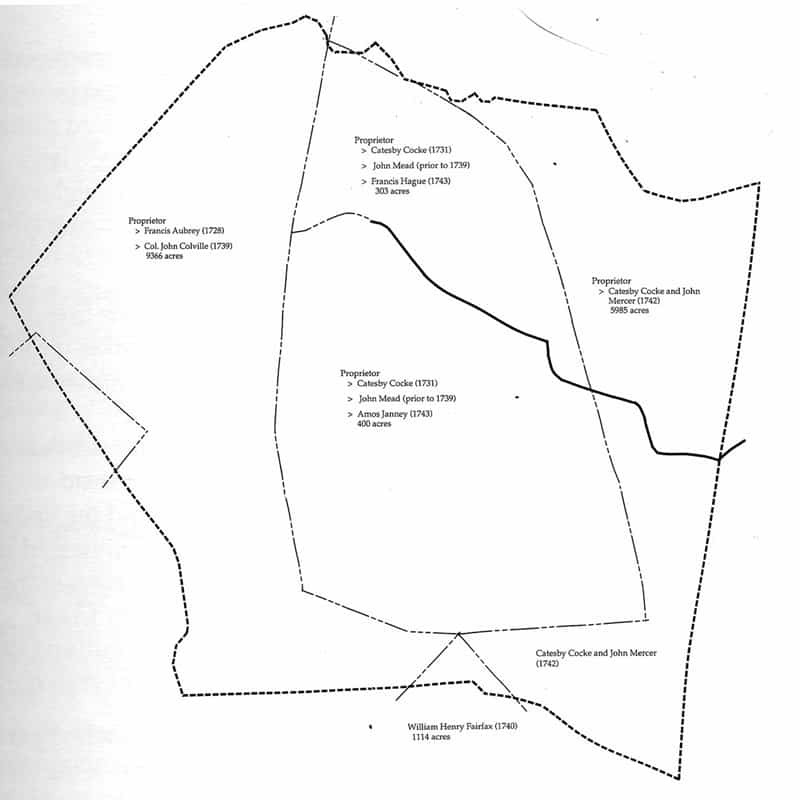 Once granted in a patent, land was parceled out in three ways. The title to the land could be transferred outright by means of a lease and release, which might demand some form of annual token payment traditionally on St. Michael's Day. To encourage settlement, other parcels were sold on the condition that the owner established a farmstead including patent house and barn, and cleared and planted fields within a specified amount of time. Other tracts were leased out for the period of three lifetimes. The occupant retained the right to continue to lease the land for the longest lived of the three people named in the lease, provided he met certain conditions. These conditions included the construction of a dwelling house and barn or granary, the dimensions of which were often specified, planting of apple and peach orchards, and specified maintenance. Tobacco cultivation was strictly prohibited without permission, and the tenant was required to "become a customer" to Tankerville's grist mill, saw mill, bolting mill, and fulling mill provided they were within five miles of the dwelling house. As the land west of the Catoctin Range became desirable for settlement the original speculators began to sell off parts or all of their holdings. By 1743 Catesby Cocke had sold one of his grants to John Mead. This was the 703 acres which would become the heart of the Waterford National Historic Landmark District. Although no deed exists for this sale, Mead sold the 303 acre "balance" of the parcel he purchased from Catesby Cocke to Francis Hague in 1743. At this time, Amos Janney was already listed as owning the adjoining 400 acre tract. Therefore, Janney must have secured the parcel from Mead between 1731 and 1743. According to a reference in the records of the Society of Friends in Waterford, Janney migrated to the area with his family from Pennsylvania around 1733, and is its first known permanent settler (Hinshaw, p. 358). Once settled on the banks of the Catoctin, Janney began to work as a surveyor for others who wished to take advantage of the unclaimed land between the hills rather than pay rent to the speculators who were leasing out parcels of their large holdings. Many of the patents from the Proprietor between 1740 and 1742 were surveyed by Amos Janney. Of these many were made to grantees "of Pennsylvania" or "late of Pennsylvania" indicating that there was a Quaker connection. Janney learned to use the system of land patents, reserving some of the best parcels with access to water for himself and his immediate family members. Settlers in the eastern part of what is now Loudoun County were often members of the English families who had originally settled the tobacco-growing Tidewater region of Virginia. At the same time, colonists from New Jersey, Pennsylvania, and northern Maryland realized an opportunity to expand into the western portion of the county between the ridges of the Catoctin Mountains to the east and the Blue Ridge Mountains to the west. Many of the new "immigrants" came to the western portion of Loudoun from Pennsylvania following the Monocacy and Potomac Rivers south.
" The transported habit of life and of agriculture of [the Tidewater Cavaliers] was so markedly different from that of the Quakers of Catoctin that there soon developed misunderstanding in the conduct of the county administration of Loudoun" (Harrison, p. 329). 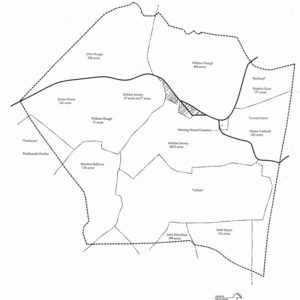 It was in 1757 that Fairfax County (created from part of Prince William in 1742) was carved in two from north to south, with the western portion becoming Loudoun. The distance of outlying lands from the courthouse helped justify the division, but differences in lifestyle and agriculture between the residents of Tidewater and Piedmont also contributed to the need for such a division. In 1798 the boundary between Loudoun and Fairfax was adjusted further west to its present location at Sugarland Run.